The Pere Marquette River is a designated National Wild and Scenic River--covering 66 miles over four counties. It flows westerly from Lake County, through the communities of Baldwin, Branch, Walhalla, Custer, Scottville, and Ludington--draining into Pere Marquette Lake and eventually Lake Michigan. The PM River is not deep, averaging two to four feet deep and about 30-40 feet wide. The Pere Marquette Loop makes for a nice short trip. It starts at Old US-31 in Ludington and circles near the State Road Bridge. From there to Scottville Riverside Park, the river becomes wider with no landings, making for a long trip. Custer Park and Indian Bridge are two landing spots within the section between Scottville and Walhalla, where the river is wide and deep. Starting in Walhalla, there are three major sections: Walhalla to the Upper Branch Bridge; Upper Branch to Bowman's Bridge and Bowman's Bridge to the M-37 Bridge in Baldwin. The PM River is an extremely popular fishing location, due to the abundance of rainbow trout. Steelhead are also very prominent, as well as various species of frogs, crayfish, snakes, and turtles. Within the Manistee-Huron National Forest that surrounds the Pere Marquette River, there's an abundance of wildlife including deer, wild turkey and small game. 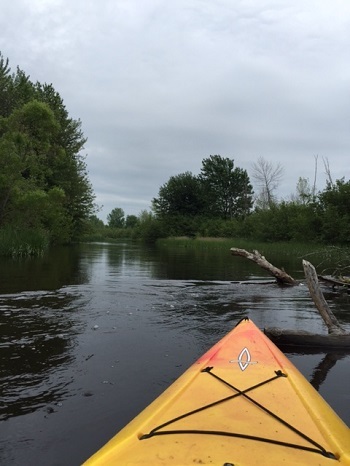 The current of the Pere Marquette River is steady and considerably clear, which makes it perfect for paddlers with basic skills. Depending what section you decide to canoe or kayak, your trip can take you anywhere from a few hours to a few days. There are numerous canoe liveries along the river, and over 2,000 private campsites dispersed throughout the watershed. Locally, you can enter the Pere Marquette River from old Pere Marquette Highway, just south of Ludington...Scottville Riverside Park...Indian Bridge on Reek Road southeast of Custer and Walhalla Road Bridge south of Walhalla. For fishing license information, click here. Whatever your preference--sport fishing, a relaxing canoe trip, or camping in the forest--the Pere Marquette River and surrounding area is the perfect spot for your next vacation or day trip. Any season--any time--the PM River is where you want to be. We have listed our area events in our festivals & events story so you can see at a glance what's happening when. You can get event details by checking our calendar of events pages and selecting a specific month. There's always something fun going on, no matter what time of year. You'll never be bored along the PM River! When you visit a community away from home, it's typical to find yourself eating out, shopping, or looking for things to do. Merchants along the PM River are happy to serve you with a smile! So, browse at our specialty stores in Scottville and nearby communities. Relax, and enjoy a meal at a local restaurant. Discover the many businesses ready to entertain you, or to provide you with a variety of services.